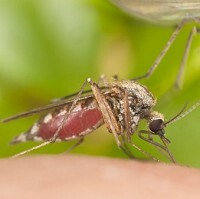 Scientists are planning to study the buzzing sounds made by mosquitoes as part of attempts to combat the spread of malaria. The University of Brighton has been awarded a £194,000 grant by the Leverhulme Trust to explore how the sounds are used to control breeding behaviour. Professor Ian Russell, an auditory neuroscientist, will lead the research along with mosquito sensory behaviour expert Dr Gabriella Gibson. It is known the male mosquito's hearing organ is the most sensitive of all known invertebrate 'ears'. Prof Russell explained the dulcet flight tones we often associate with the insects are used to guide males by sound alone towards a potential mate. The study will aim to use this information to help to reduce the number of malaria cases, which reached 219 million in 2010, according to the World Health Organization. Researchers will look at the acoustic distortions when tones of two mosquitoes are heard by a female and how it helps her to recognise that the male is of the same species. The effects of this research could take a while to make a real difference to travellers, but those heading to countries that have a high malaria risk can have an extra safety net with medical travel insurance.